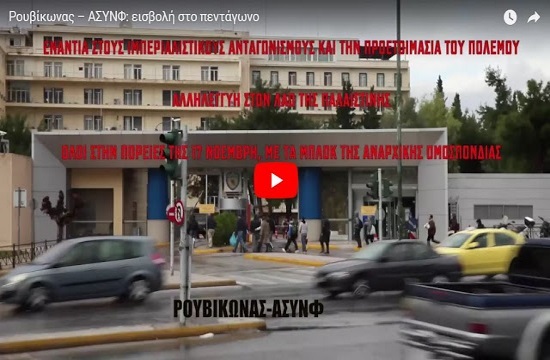 Members of the self-proclaimed anarchist group Rouvikonas stormed into Greece's National Defence ministry on Friday and threw leaflets expressing support for the Palestinian people and condemning imperialists. The group, about 10 to 15 individuals, entered through the main car gate on Messoghion Avenue at noon, proceeded to the courtyard before the main building and after throwing the leaflets were blocked by security personnel and then departed. There were no arrests even though the police were informed. According to ministry sources, National Defence Minister Panos Kammenos ordered that staff responsible for security should be identified and punished in an exemplary way. The national defence general staff chief ordered a formal administrative inquiry into the matter.